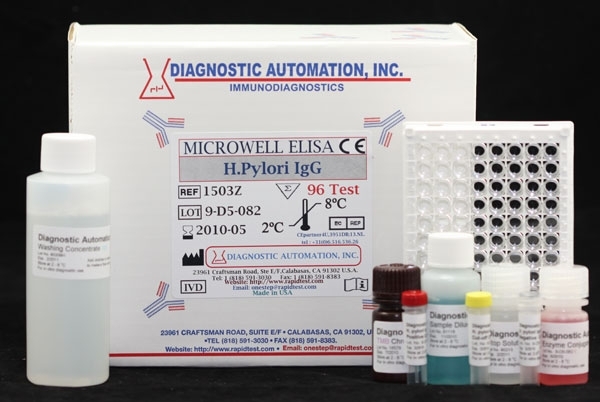 Diagnostic Automation offers H. pylori IgG ELISA kit for evaluating the serologic status to H. pylori infection in patients with gastrointestinal symptoms. H. pylori elisa testing the presence of H. pylori specific IgG antibody, is the technique of choice for serologic tests because of its accuracy and simplicity. 2. Non-invasive techniques include urea breath tests and serological methods. Serologic tests are employed to detect antibodies as human immune response to H. pylori. Two methods appear to be of great interest regarding their use in H. pylori routine serology, namely the ELISA and the Western immunoblot because they offer the most versatility in regards to immunoglobulin specificity and relative ease of use. Purified H. pylori antigen is coated on the surface of microwells. Diluted patient serum is added to wells and H. pylori IgG specific antibody, if present, binds to the antigen. All unbound materials are washed away. After adding enzyme conjugate, it binds to the antibody-antigen complex. Excess enzyme conjugate is washed off and TMB Chromogenic substrate is added. The enzyme conjugate catalytic reaction is stopped at a specific time. The intensity of the color generated is proportional to the amount of IgG specific antibody in the sample. The results are read by a microwell reader compared in a parallel manner with calibrator and controls. Negative: H. pylori M Index of 0.90 or less are seronegative for IgG antibody to H. pylori. Positive: H. pylori M Index of 1.00 or greater are seropositive. For additional details please refer to the instructions for use. Total of 347 patient samples were used to evaluate specificity and sensitivity of this H. pylori elisa test. Non-reactive for hepatitis B surface antigen as well as HIV antibody with FDA licensed reagents. However, these reagents should be handled at the Biosafety Level 2. At least half the world s populations are infected by H. pylori, making it the most widespread infection in the world. Actual infection rates vary from nation to nation. The developing world has much higher infection rates than the West, including Australasia, North America, and Europe where rates are estimated to be around 25%. The age at which H. pylori is acquired seems to influence the possible pathologic outcome of the infection. People infected with it at an early age are likely to develop more intense inflammation leading to atrophic gastritis with a higher subsequent risk of gastric ulcer, gastric cancer or both. Acquisition at an older age brings different gastric changes more likely to lead to duodenal ulcer. Our H. pylori ELISA Kit a great tool for detecting H. pylori infection.